Ionic is the second of the Three Classic Order. It absorbs and resumes the oriental motifs, it enriches the decorations. It adorns the architectural structure and it does not weigh it down. THE ORIGIN OF THE DORIC ORDER. The Ionia, which refers to the southwestern costland and to the islands of Minor Asia settled by Ionian Greeks and where an Ionian dialect was spoken, is the homeland of the Ionic order. It was born in the middle of the 6th century BC. 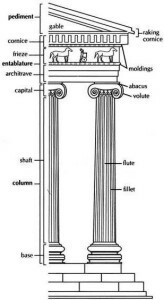 The ionic order column was used in Greece during the 5th century, but it was more popular during the Archaic Period (750-480 BC) in Ionia. The Temple of Hera on Samos was the first of the greatest Iconic temples. 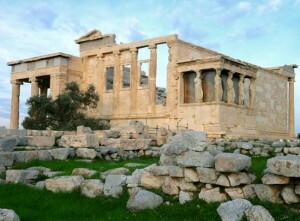 It was built by the architect Rhoikos between 570 and 560 BC, but it stood for only a decade because of an earthquake. The Temple of Artemis at Ephesus was a 6th century Iconic temple and it was one of the Seven Wonders of the Ancient World. The Parthenon, although it conforms mainly to the Doric order, also has some Ionic elements. 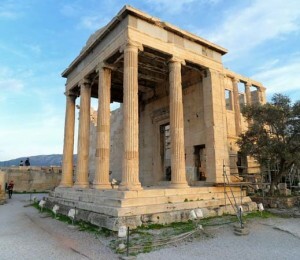 The Erechtheum and the Temple of Athena are also examples of the pure Iconic mode. They are both on the Athens Acropolis. A more purely Ionic mode to be seen on the Athenian Acropolis is exemplified in the Erechtheum and the Temple of Athena Nike, both on the Acropolis of Athens. Eretteo, temple of Goddess Athena Polias, V sec BC (421 BC– 406 BC); Atene, Greece. Temple of Athena Nike, V secolo BC (425 BC); Atene, Greece. Depending on the location and the time of the year, we can find different forms of the Ionic order. The socalled “attic base” is the best known and most common one. 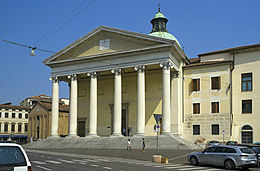 It derived from the place it was used for the first time (Toro, Trochilo, Toro). The shaft of the column is therefore based on the base, and has grooves in the rounded edge. The abacus above the capital is very flattened and the echinus is small. Above the capital, there is the entablature. It is composed by a tripartite architrave, made up of three overlapping plates. Each higher and more prominent than the one below. The frieze rests on it, with painted representations, developped along the entire perimeter of the temple, so as to allow a long narration without interruptions. 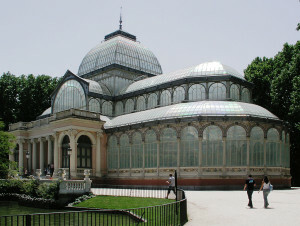 There are many buildings which embed the Ionic style today: the Cathedral of Treviso and the Crystal Palace in Madrid, for example. Previous Previous post: The Doric Order – 6th Century B.C.